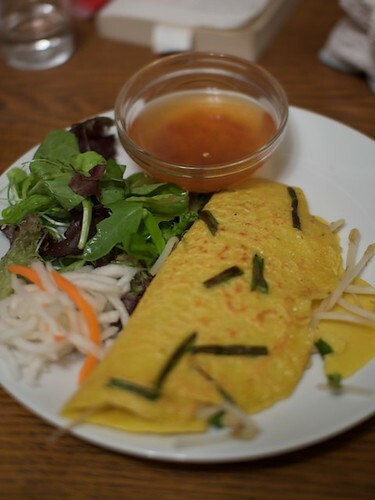 This was my first time making a Vietnamese crepe called banh xeo. 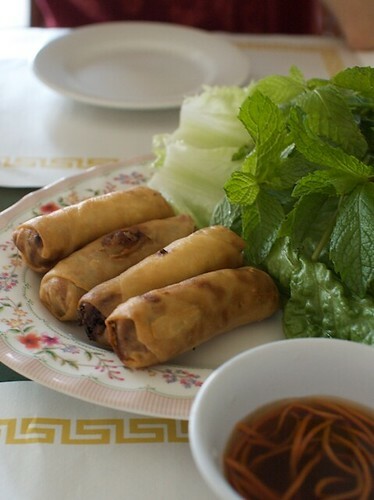 I’ve had it several times in Vietnamese restaurants and it’s always been a refreshing way to start the meal. It’s basically a rice flour crepe with some turmeric thrown in for its signature yellow color. Some markets sell pre-mixed banh xeo powder which is just rice flour, powdered coconut milk, and turmeric. I preferred using the rice flour because having general rice flour is handy. Usually the filling is a mixture of pork and bean sprouts, or even shrimp, but I made a vegan version with just bean sprouts, enoki mushrooms, scallions and fried slices of baked tofu. Mix together with a whisk until everything is incorporated and there are no dry spots or lumps. I made a mistake of throwing in a dash of cinnamon because I thought it was turmeric, but it didn’t seem to harm the flavor at all. I’ve seen restaurants and recipes use a different batter version with just water, but I think the coconut milk gives it more flavor. Yes, you read correctly. Delicious. Vegan. Pho. Thuyen Vein is a small restaurant in Garden Grove that we had put off going to for a while just because Garden Grove is so far south of where we usually are. When we finally had the opportunity to visit, boy, we were not disappointed at all. Although we only had a few hours before dinner and shouldn’t have had such a large lunch, I couldn’t help but order some eggrolls as appetizers. When can I ever turn down freshly fried eggrolls? The eggrolls from Thuyen Vien came out dangerously hot, but I scarfed one down immediately. 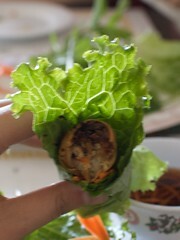 The filling was good, the skin crispy, and the vegan fish sauce to dip it in was convincing. The one gripe I have about the eggroll dish was that it didn’t come with the pickled slivers of radish and carrot. Don’t let the picture fool you, those were just regular carrots in the sauce, not pickled. On that note, let’s talk about how to eat a Vietnamese eggroll. Now I’m not going to say this is authentic, but this is how my family (with members who lived in Vietnam) eats them. Eggrolls are best when they come fresh out of the fryer and are almost too hot to touch. But how do you get them in your mouth without getting third degree burns? Lettuce! Wrap each roll in a big leaf of lettuce with a few leaves of mint, some pickled radish and carrots (missing here unfortunately! ), and then dip into the dipping sauce. Hopefully the dipping sauce and cool lettuce is sufficient protection from the heat of the eggroll. If not, man up and eat it anyway. Hot eggrolls are excellent. 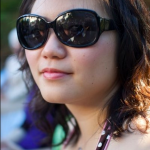 Prior to eating at Thuyen Vien, I had a special place in my heart for Vin Loi Tofu in the valley. It was the best place to get vegetarian (vegan even??) Vietnamese noodle soup and their home-made hot sauce was always a treat. 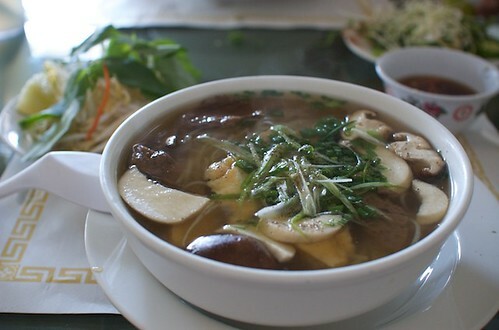 Other than at Vin Loi, I’m cautious about ordering vegetarian noodle soups just because the real deal (with meat!) is so good there’s no way a non-meat version can stack up. 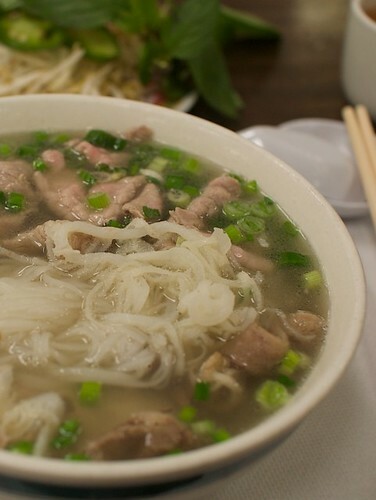 Well, beef pho, meet your veggie match: pho bo from Thuyen Vien. Now I’m not saying the broth is as good as the liquid gold at places like Golden Deli, but damn, it comes close. The spicing has the perfect amount of star anise, salt, and other magical pho broth ingredients. All it was missing was the beefy flavor, which most veg*ns probably won’t miss. The fake beef pieces I could do without, but the rest of the toppings were excellent as well. The shiitake mushrooms were fresh and packed full of umami flavor. The king trumpet mushrooms also were good and not their usual boring selves. The noodles: perfectly cooked as well. 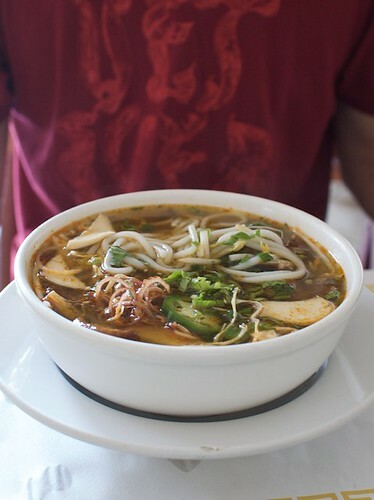 The BF ordered bun bo hue, which unfortunately after tasting the fantastic beef pho was a notch lower in quality. It wasn’t bad by any means. It was strong with lemongrass flavor and had a nice kick thanks to the chili peppers, but the broth just wasn’t as deep or as satisfying as the meat version. If I hadn’t had the pho before, I would have liked this bowl better. Thuyen Vien is definitely a place any vegetarian (and vegan) who likes Vietnamese food should visit. I scoff at anyone who claims that this place has the best bowl of pho ever, but I believe it when they say it has the best bowl of veggie pho ever. It’s so delicious, I don’t doubt that there’s a crapload of MSG in each spoonful. I certainly was thirsty immediately after leaving the restaurant. But hey, I have nothing against MSG! The only bad thing I can say about this restaurant is it’s so damn far from where I live.